Jellysmack, a digital media company with a focus on social video, is beefing up its sales team with the addition of Jenifer Geller, Refinery29’s former VP of sales and brand partnerships for beauty and wellness. After spending three years at Refinery29, Geller will now serve as Jellysmack’s head of beauty sales and partnerships, a newly created position within the company. Jellysmack runs several digital brands (Oh My Goal, Beauty Studio, Gamology, Riddle Me This, Genius Club) with millions of followers across YouTube and Facebook. Geller will be responsible for leading JellySmack’s go-to market strategy with the goal of increasing the company’s strategic value in the beauty space — an area the digital media company says it’s experiencing strong growth. Its beauty brand, “Beauty Studio,” garnered more than 1 billion views across Facebook and YouTube in November and more than 900 million views in December. Geller will report directly to Brent Spitzer, head of sales and partnerships. Gellar’s hire is one of many for Jellysmack, which has bolstered its senior team over the past several months. In September, Eric Korsh, former President of Mashable Studios, was brought on as head of studios; Brent Spitzer, formerly head of commercial for Red Bull North America, was hired as head of sales; and Amanda Ferri, who ran product marketing at Tumblr, was hired t0 head up marketing. The new hires follow a $14 million series A financing round for Jellysmack, which was led by Highland Europe, with participation from Interplay Ventures and Seed Round Investors Partech and OneRagtime. 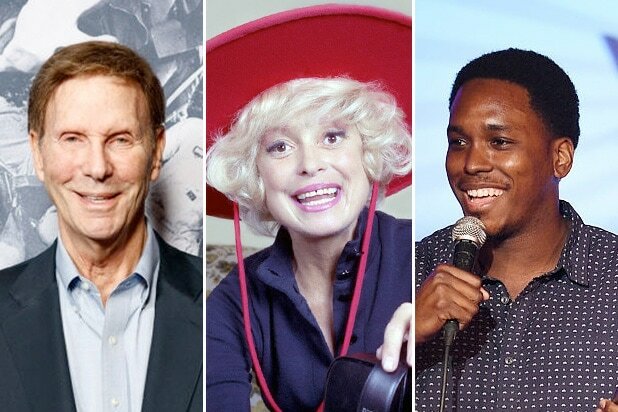 Here’s a list of some of the notable celebrities and industry professionals in film, TV, music and sports who have passed away in 2019. The New England broadcaster who appeared in several Oscar-winning films like “Spotlight” and “Mystic River,” died Jan. 1. Stapleton was 55. The “Curb Your Enthusiasm” and “Arrested Development” actor (and brother of actor-filmmaker Albert Brooks) died Jan. 2. Einstein was 76. The “Animal House” and “The Last Temptation of Christ” actress died Jan. 9. A family spokesperson told USA Today that Bloom died from complications from dementia. Bloom was 80. The legendary Broadway and musical actress (“Hello Dolly,” “Gentlemen Prefer Blondes”) died Jan. 15. Channing was 97. The Hungarian producer who worked with Arnold Schwarzenegger and Sylvester Stallone on some of their most popular films, including “Rambo” and “Total Recall,” died at his home in Budapest on Jan. 20. He was 74. The comic and co-creator of “Rel,” the Lil’ Rel Howery-led sitcom on Fox, died Jan. 22 due to a hemorrhage. Barnett was 32. The French composer who won three Oscars for his songs (“The Windmills of Your Mind”) and film scores (“Summer of ’42,” “Yentl”) died Jan. 26. Legrand was 86.